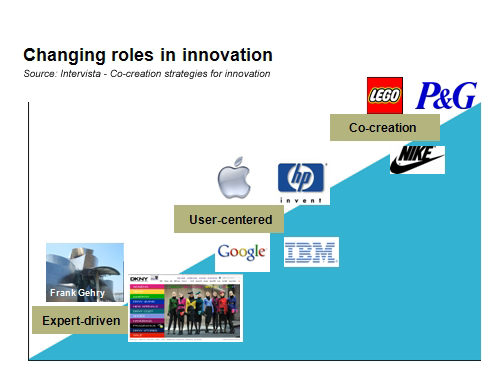 In fact, in a recent web lecture from Intervista�s innovationcultures program, Liz Sanders, pointed out the changing roles of people in innovation, mainly that of cosumer to co-creator. 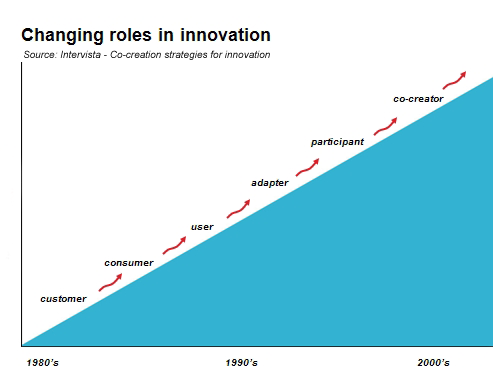 As a design research expert, Sanders has studied the historical changes in how consumers are perceived and their changing role in the innovation process. �Going back over the last 20 or 30 years, if you take a look at the names of the people we are serving through design we see dramatic changes. "Up to the 80’s the only words that we used were customer and consumer.” In the late’80s we started to use the word ‘user’ because we were developing personal computers that ordinary people couldn’t use – so there was a big effort on understanding people as users in addition to being customers and consumers.